Cast your mind back to December 2011. We Found Love was in the top 10; Little Mix were about to win the X Factor; Azealia Banks was still considered a thing. 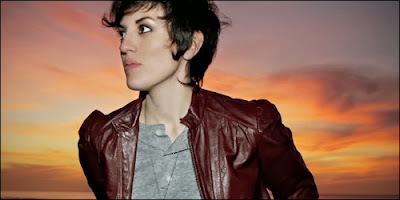 Around that time, I also happened across a new singer called That Girl With Dark Eyes - real name Tiffany Garrett Sotomayor - who had been recording some very interesting pop music with Pascal Gabriel of Goldfrapp and Ladyhawke and Blondie fame. Half Spanish, half American, she was recording in France, using synths made in Japan. It was very exciting from an international relations perspective. Such is the lugubrious pace of the music business that TGWDE is only just getting ready to release her first official EP. A video, Lonely As A Wolf, is due to premiere on the internet (how modern) later this month. BUT FIRST, here is a remix she has done of Tegan & Sara's Closer. TGWDE gets out her magic duster and polishes an already shiny song to a blinding gleam. It's a clever, subtle reworking - a few more synth pads here, a little funky riff there - but it pinpoints why we should be getting excited about her solo material. Here's a woman that really understands how to fine-tune a pop song. Listen below, and download it for free on TGWDE's Soundcloud page.